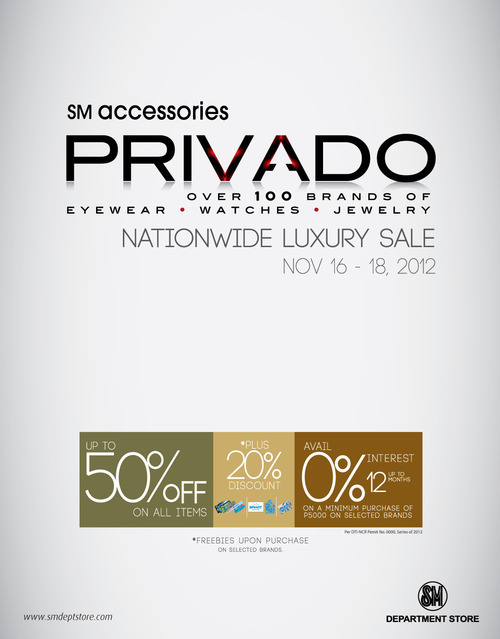 SM Accessories will be having their biggest and grandest luxury sale event, PRIVADO. A three-day luxury sale of branded eyewear, watches and jewelry from Nov. 16 to 18, 2012 in all SM branches NATIONWIDE. ♥ Kenneth Cole and a lot more! Up to 50% off on these luxury brands, plus 20% discount with your SM Advantage, SM Prestige, or BDO Rewards card or when you are a SMART Rewards member or when you are a Citibank cardholder. See the attached poster for more details.